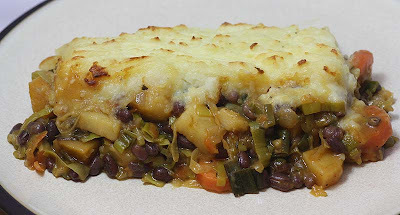 The British comfort food 'Shepherds pie' seems to be making a comeback as its been appearing on a lot of blogs recently. I wonder if Gwyneth Paltrow has got anything to do with it?! Anyway, I thought I'd make some this weekend too. However, mine of course is made without minced meat, it not even made with faux meat, but with some seasonal winter vegetables and aduki beans fondly called "red dragon" or "red wonder" beans. 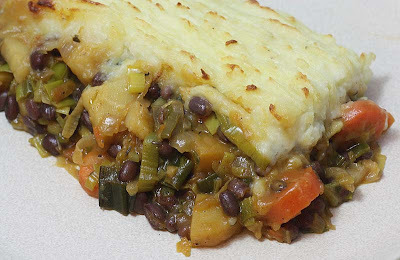 Another thing, this Shepherds pie is actually called Shepherdess pie simply because its meat free. And as its officially spring, I am going to say this Shepherdess has little lambs jumping around her with joy. I'm such a romantic sometimes. The last time I made this Shepherdess pie was in 2005. How can I remember you may wonder? Well whenever I cook a recipe from a cookbook, I often scribble on it the date and how I found the dish. My scribbles reveal the date 4th January 2005 and my comment next to the recipe was it was very strong in flavour. I think this was because of the yeast extract which I reduced this time. The pie was really good. All the vegetables were cooked well and the flavours of each came though. I was particularly nervous about the swede, but even that was tender. Some of you may know that I am not a big fan of mash either, but this one was actually very good too. I think the reason was the crispness on the top. This recipe makes a large quantity. Enough to serve 6, maybe even 8 people with accompaniments. So its a dish that is going to feed us at least three times this coming week. This dish had a number of different processes to bring it together, so my recommendation make this pie when you have time on your hands to potter in the kitchen, which is what I did this afternoon when it started raining outside. 150g aduki beans, soaked overnight and then cooked for 45 minutes until tender. Drain and set aside. For the vegetables: Preheat oven to gas mark 5. Place the swede cubes on a baking tray with oil and salt and cook for 20 minutes, then add the carrots and parsnips and cook for a further 15 minutes, until all the vegetables are tender. Set aside. Stir fry the leeks in a little olive oil until soft. Set aside. For the sauce: In a saucepan place the butter, onion, leeks carrots paprika and rosemary. Cook until completely soft. Reduce the temperature and stir in the flour. Cook for a few minutes until the texture of roux changes to that of breadcrumbs. Gradually add the vegetable stock and mustard, yeast extract, tamari and tomato puree. Bring to a boil and season. Set aside. Combine the cooked aduki beans and all the vegetables with the sauce. Turn out into a deep ovenproof dish. Prepare the topping: by mashing the potatoes with salt and pepper until smooth and free of lumps (I actually get D to do this as I am a very bad potato masher. I like texture and lumps in my mash). Optional: stir in Cheddar cheese. Top the vegetables with the mashed potatoes and fork over gently if you want it to have that forked effect. Bake in the oven for 35 - 40 minuted until golden brown. Adapted from the brilliant New Food for Thought. Hey, this looks wonderful. I really like that you didn't use faux meat. I made some Adzuki beans the other day. I overcooked them a bit, so I just made them into refried beans. They were delicious, so I know I would love your Shepherdess Pie-I'm going to try it for sure! 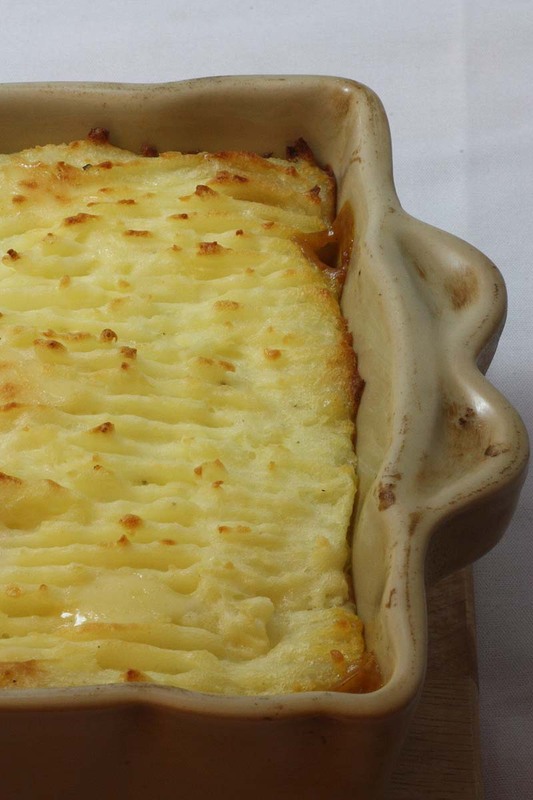 Shepherd's Pie is one of my favourites, but so is mash so that's probably why. This looks like something even my kids would enjoy - a good way for me to sneak more veggies into their diet. Thanks for the inspiration! Wonderful. 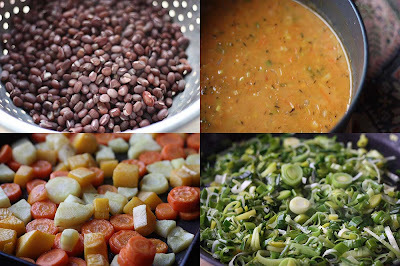 I make a version of this quite regularly, but never thought of including adzuki beans. I bet that would be delicious. I'm especially intrigued by the marmite. Going to have to try that next time. BTW, Food for Thought rules! I took my mom there last time she was over and she liked it so much she bought the cookbook. I've been meaning to pick myself up a copy. She also made this Sweet Potato Quiche, inspired by our meal there. I haven't been back in ages... must make a point to do so next time I'm in London. I could use a slice of your Shepherdess pie right now, Mango. It looks really delicious. I agree Vic. It is proving to be popular, esp this time of the year when warming comfort food is desired. Thank you so much e.
Adzuki beans as refried beans - now thats a thought, sounds delicious. The marmite makes it quite 'meaty' I think, hece the reason I reduced it as I found it a tad overpowering. I've never eat at Food for Thought, so am envious of your experience. I must look up the Sweet Potato Quiche. I'd strongly recommend getting a copy of the book. I have the original copy which I picked up second hand, and the New one. Funny enought, the new book is falling apart. Barbara I still have some. Would you please tranport yourself over using Star Trek technology. This is a great version of the recipe! Love the addition of the aduki beans and I want to try it! I have never had Shepherds Pie, but your's sure looks great! This one is truly packed with flavour. I particularly like the photography of this post. It would never have occurred to me to try make a shepherd's pie a meatless shepherdess, but it looks very tasty! Food photography is certainly an art, sometimes the photos work well, other days - not so much. This really is a flavour packed pie. Thank you so much Cooking Foodie. I've also made a South Asian style one with spices, it really is delicious. Please do have a go. By golly I am so behind reading blogs, this looks deliscious and blow my mum found a packet of adzuki beans at the back of the cupboard today when she was doing a clean up. I generally buy adzuki beans dry but the shop I get all my dry legumes from haven't had adzuki beans for months now. So I'll try to remember to cook this dish up next week as we had potatoes already this week.